SCAA Certified Coffee Makers – Which One Is Right For You? In the world of coffee makers, it may surprise you that there is more than just the typical ones you find in your local big box store. In fact, those coffee makers usually don’t brew coffee to the best of the beans full potential. This is mainly because the brewing temperature is cooler than it should be. 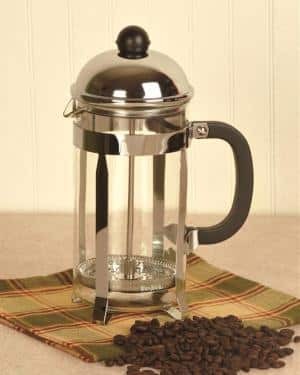 The ideal temperature is between 195 F and 205 F.
The Specialty Coffee Association of America has rigorously tested home coffee brewers that are submitted to them and publishes their recommendations on their website. Surprisingly, there are only 12 home brewers that have made the cut. If you really want to nerd out, you can read all about each test on their website but as you can see, there is a lot they are testing for. Once they recommend a brewer, you can trust it will brew a quality cup of coffee. So enough of the technicalities, let’s get into these 12 Brewers one by one. For your ease, we have included links where you can find them on Amazon. 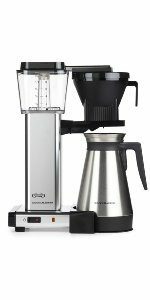 Technivorm is synonymous with long lasting coffee makers that brew exceptional coffee. Made entirely by and in the Netherlands, Technivorm says that this is the last coffee maker you will have buy. And because of Technivorm’s rigorous testing of each machine they make, they have made a name for themselves especially with the SCAA. 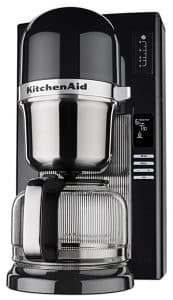 All of their models are approved with the SCAA so depending on your budget and needs, you can find a coffee maker for you. Did I mention colors? One model even comes in up to 13 different colors and finishes. All of these brewers feature a copper boiling element to heat the water, a unique feature that sets it apart from the others. 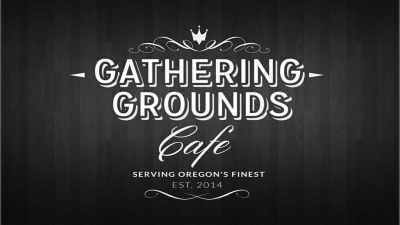 A one cup brewer that doesn’t use K-Cups, is it possible? Technivorm has done it with their Cup-One brewer. It uses #1 cone filters and comes with 80 to get you started. It is only 6.5″ wide and 12″ tall making it quite comparable and even a lot smaller than other single coffee brewers out there. 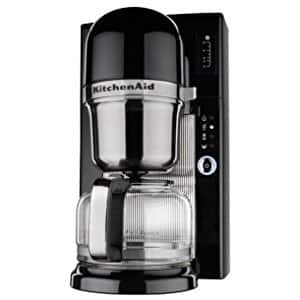 It is the smallest brewer Technivorm makes and it easily outperforms single brewers in coffee flavor. 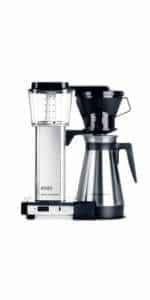 Finally, for those who just want a basic 8 cup coffee maker, Technivorm makes 8 cup models that brew in about 6 minutes. 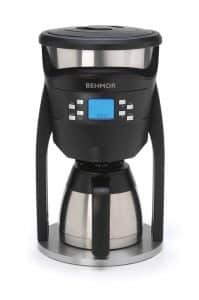 As the name suggests, the Behmor Connected Brewer is the first smart coffee brewer certified by the SCAA. All you need to brew your coffee is literally your voice. The brewer is controlled by the free Behmor app that allows you to customizes brew temperature, pre-soak time, brew time, and altitude so you get the perfect brew. The app keeps you informed of the brewing process and texts you when it is done. It integrates with Amazon Echo which allows Alexa to be your Barista. After putting grounds and water in, simply say “Alexa, ask Behmor to make my favorite coffee.” It’s a little over the top in that way but hey, it’s fun to control machines with your voice. Of course, it can still be controlled manually but this is definitely the most technologically advanced certified brewer out there. 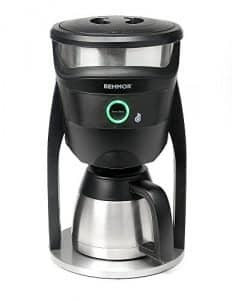 The biggest difference between the Behmor Brazen and the Connected Brewer is that the Brazen is controlled by the controls on the brewer and not with an app. You can still control the temperature, altitude, and pre-soak time and it still brews a great cup of coffee. Programmable through the buttons on the face of the brewer, delay start or control the variations in your brewing preference. KichenAid successfully made two certified coffee brewers, one digital and the other non-digital. Both automatically mimic and brew pour overs making it convenient and satisfying in the result. Its sleek design looks great on your counter and brews amazing pour over coffee that you don’t have to fuss with to get. 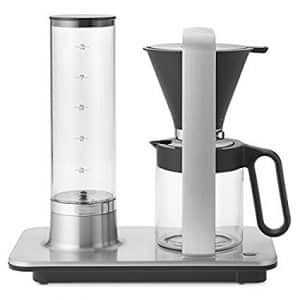 This 8 cup brewer is the non-digital version and features a display of where it is in the brewing process as it brews. 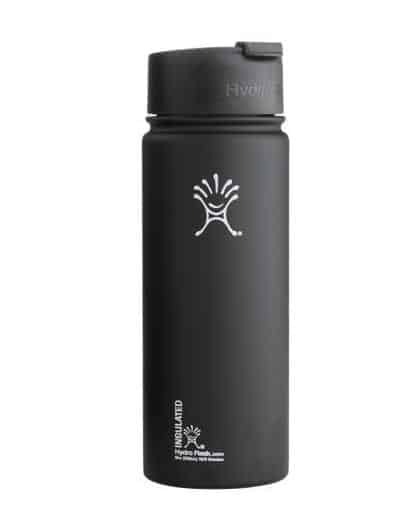 It brews between 198 F and 204 F and the design allows for minimal heat loss as it travels to the carafe. It is pretty straightforward and easy to use but it is not programmable for a delay start. This is the updated model that features a digital display and allows you to customize the quantity, roast level, and up to a 24 hour delay start so you can wake up to your coffee in the morning. The roast level option allows you to select between medium and dark roasts so that the different subtleties can come out in the flavor of the brewed coffee. Similar in design to the above model, there is minimal temperature loss. 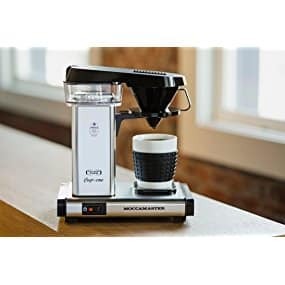 Again, it blooms the coffee, evenly saturates the grounds, and then steeps the coffee for precisely the right time so you can have the taste of pour-over in a home coffee brewer. 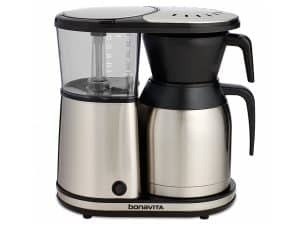 Bonavita makes 2 certified coffee makers a digital and non-digital model. Both are certified so it really just depends on what you like out of your coffee maker. They are also both a lot more affordable then the other brewers we have talked about so far. 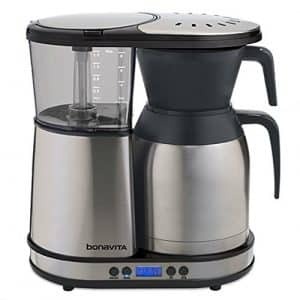 The Bonavita BV1900TS is an 8 cup brewer with a stainless steel insulated carafe. When you are brewing your coffee, the best thing you can do is keep it warm without cooking it. And while we recommend you drink your coffee no less than 30 minutes after it brews for the best taste. We understand that sometimes, you want the flexibility and ability to sip on your coffee and still be able to refill your cup. It also has an optional pre-infusion setting that will bloom the grounds so they brew best. The Bonavita BV1900TD is the digital model of Bonavita’s previous model. And while the above model is one-touch start, this one is programmable. A big plus for those of us that like to set our brewers up the night before. 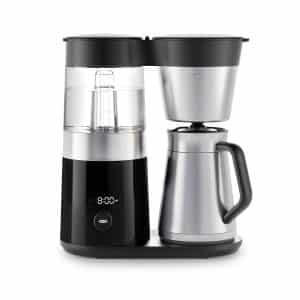 Oxo has also developed 2 certified coffee brewers and they are as different as night and day, if that is possible. The 9 Cup model is your typical coffee brewer but the 12 Cup model has a removable kettle that allows you to not only brew your coffee, but heat water for tea. Both are controlled by a micro-processor to brew coffee to exactly your pour-over specifications. It pre-soaks the grounds to allow them to bloom and off gas and then monitors the time, temperature and volume from beginning to end. 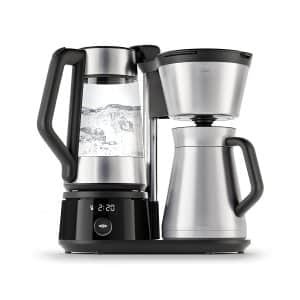 Oxo’s 9 Cup coffee maker is both attractive and unique in its design elements. It has a backlit display on its black cylindrical body and you can watch your water pump up and bubble from the water reservoir to the shower head. It also displays how fresh the coffee is after it brews. This is a nice feature in case someone else starts the pot and you want to know how long ago it was brewed. It also keeps you informed along the way as it is brewing. 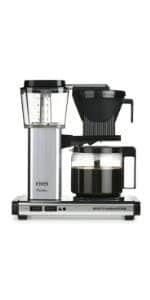 The Oxo 12 cup coffee maker has much of the same features as the 9 cup but with the flexibility of a tea kettle as well. It even has a setting to brew coffee or just heat water for tea. Of all the Coffee brewers we have seen so far, the Norwegian designed Wilfa actually looks like a pour over machine. The water reservoir resembles a beaker rather than your typical tank and the water is pumped through the tubes into the filter basket that sits on the carafe. Removable water reservoir allows you to fill it at your sink for the precise amount of coffee to water ratio which is printed on the side. 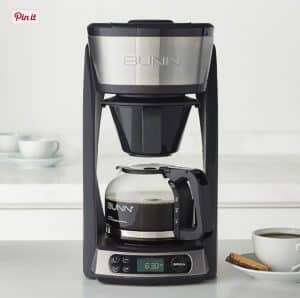 The Bunn Heat N Brew coffee maker is Bunn’s only certified coffee maker. It uses their special heat and release technology thermometer to monitor the brewing temperature the entire time. It won’t release water into the coffee until the correct temperature is reached. 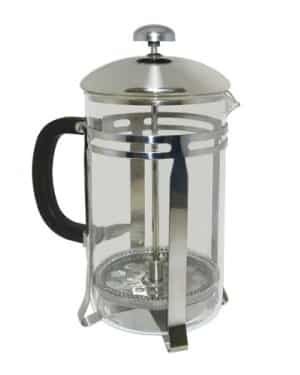 The carafe is also specially designed to not drip when pouring by using a unique plastic piece at the end to actually retract the coffee when you stop pouring. The shower head is also lime scale resistant so it will function longer without descaling. 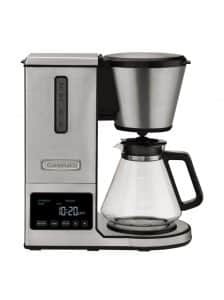 Our last coffee maker is the Cuisinart Pour Over Coffee Maker and it has some great controls over the brewing process. You can select your flavor strengths from mild, medium, and bold as well as hot and extra hot. 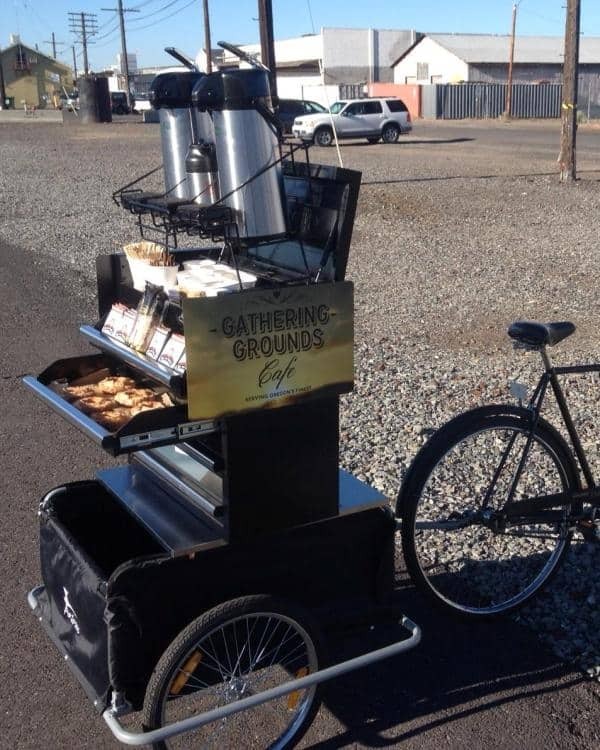 It also comes with two carafe options, glass or stainless. You made it through that long list! There are many brewers to choose from and each offers a little bit different options in their elements, selections and style. Each of these brewers have undergone the rigorous testing process that the SCAA puts them through. Each brewer will give you a quality cup of coffee and the assurance that you are brewing your quality beans to the best of their ability. As always, make sure you are using freshly roasted beans and grinding them fresh for the best tasting coffee. The Baratza Virtuoso vs Breville’s Smart Grinder Pro: Which Coffee Grinder is Better?